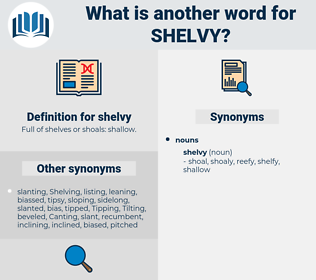 What is another word for shelvy? 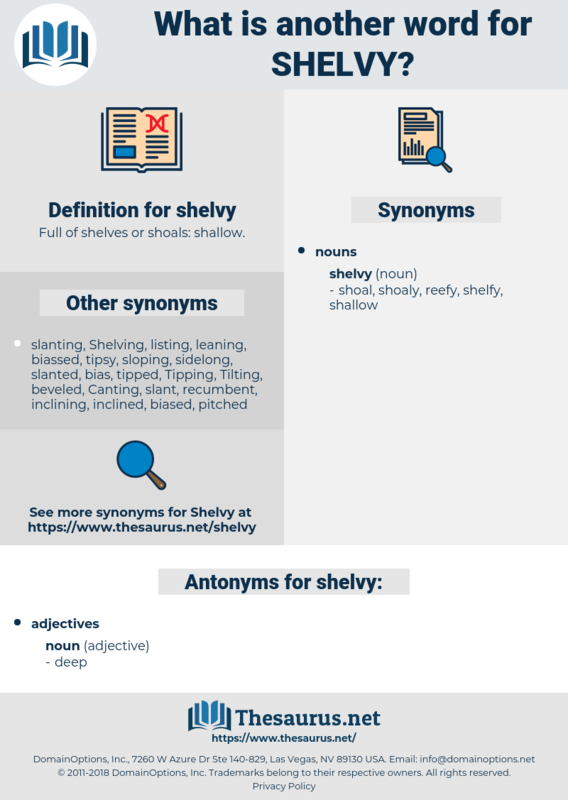 Full of shelves or shoals: shallow. They appear sloping down to the water's edge, not shelvy, but smooth, and their exuberances rounded off, and, in some places, deeply furrowed, as though they had been worn with continual floods of water. Fear then this forceful arm, and hear once more, Death stands between thee and that shelvy shore. sclaff, salvo, sell up, scale leaf, solve, schoolboy, slave, swell up, slap-up, schlep, syllabub, shelf, slope, self, sexual love, sleepy, slip off, salp, slip, scale up, slipway, skylab, slow up, slip-up, ski slope, selva, seal off, slub, slop, sea scallop, slavey, selloff, sloppy, slab, scalp, sleeve, scallop, sleep off, saliva, sick leave, silvia, sell off, sillabub, shelfy, syllabify, swallow up, soil pipe, shlep, sloop, social phobia, salvia, school phobia, sulpha, sleep, silva, solvay, slav, sylva, sylph, sea wolf, slap, slip up, slippy, solfa, slip by, scollop, salpa, slaphappy, slob, sulfa, salve, slip away, shelve.